After a long wait the Danse avec les stars Tour finally arrived Paris. The place for the show was chosen to be Le Zénith de Paris. One might remember Le Zénith from another tour, Alizée‘s first concert tour! The final concert back (17th January 2004) then took in place in the very same venue. In 1984, Le Zénith de Paris was the first Zénith music hall build in France, and just like Eiffel tower, it was supposed to be demolished just after few years! 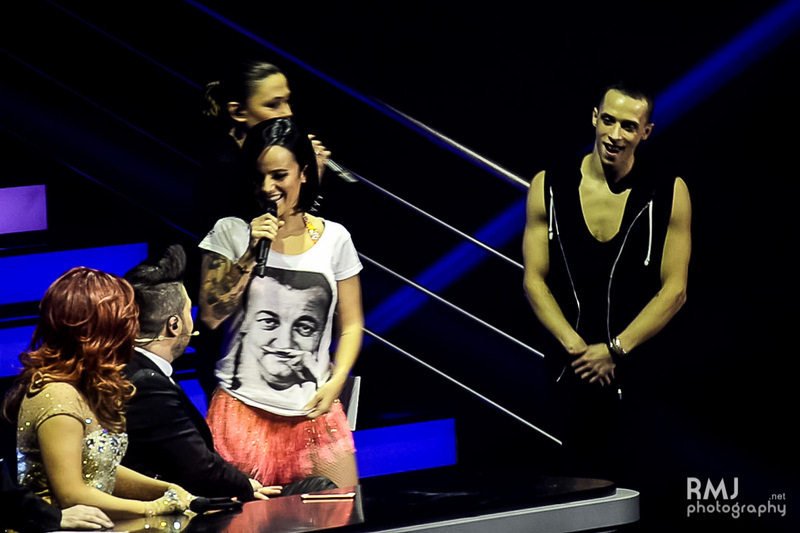 But now, Alizée had arrived here again, for three spectacles with her “DALS family” on 30th and 31st of January 2015. It was also end of my long wait to see her again dancing. Last time I saw her in Lyon, 1st of February 2014 on the first DALS Tour. Actually, I almost skipped this tour, but decided week ago that I would have to go. Finding good places for completely sold out concerts turned out to be a challenging task but somehow I managed to get rather nice seat for all of the three shows. And ended up with one extra ticket which I gave out to one of our lucky reader. Alizée and Grégoire Lyonnet were both great as usual. They were really happy to be there and seemed to enjoy the dancing from all their hearts. Grégoire had couple extra dance numbers thanks to dances danced by only the professional dancers. On the second half Grégoire (just after Alizée’s & Grégoire’s second dance) was actually lead dancer on one of those shows, and I have to say he did pretty phenomenal job with it. It’s easy to forget how good dancer he is when watching Alizée dancing with him… but when the “distraction” is gone, you can really enjoy his dancing! This year, Alizée & Grégoire had chosen their two dances to be jive and contemporary dance. The first one being very energetic dance. For the music they had chosen “Shake It Off” by Taylor Swift. And they surely did shake it off. The dance starts from the audience. Actually, on the third show, she was just behind me. She had to go around me to get there, so I gave her high five on the way. Once the dance started, she ran to the edge of stage (after going another tour around me), where they had the first part of the dance just in front of the VIP guests. Then Alizée invites Grégoire to follow her to the stage where the dance continues. Alizée dressed all in gold, she looks pretty phenomenal and her dancing doesn’t make her any less hot on the stage. The interaction with the audience continues when Alizée throws Grégoire’s baseball cap to the audience, after which they goes to tease the judges by dancing on the judge’s table. The audience seemed to really enjoy the dance and she loud applauds once it finished. After their first dance, Alizée reminded the audience of her other family, Les Enfoirés, and what important mission it is after. She couldn’t join Les Enfoirés this year because she had already agreed to join each and every DALS show during this tour and the dates overlapped (just like last year). But she did the little she could for Les Enfoirés and asked the audience to sing along her the theme song of Les restos du coeur (and Les Enfoirés). For the second dance they had chosen the music to be “Wasting My Young Years” by London Grammar. A soft song, which went well with the romantic dance they did. It’s easy dance for them as there is no need to pretend to be in love… It’s no doubt one of the nicest dance of the this year’s tour. Perhaps not the best but up in the top 3 for sure. It has little bit the feeling of their phenomenal “freestyle” dance from DALS Season 4 final. Along these two dances, she came to stage at the end of Gérard’s second dance to dance with the other celebrities and professionals with Gérard and Silvia Notargiacomo. Even if it was just a short side dance, it was nice to see there again. Obviously, at the end of the show she joined to dance one more time with all the others to finish the show. What becomes her success in Paris, well, she did okey. The Paris gig started very well actually, on the first night (Friday night) she managed to win the show with the most votes from the public. It came to me as a bit of a surprise because Rayane Bensetti was clearly the most popular by the audience in the music hall (you can vote even if you weren’t there!). But either way, it’s a great to see her getting the victory she deserved after the two beautiful dances. On Saturday, she did okey but did not manage to win this time. On the first show (15h00) on Saturday she managed to get on second place but on the last show, Nathalie took her place as the runner up. Rayane obviously was the number one on both of these shows on Saturday. Winning wise, Alizée is now on the second place. She has won six shows whilst Rayane has won eight shows. Nathalie is on third place with one win from Marseille. There are still eleven upcoming shows on this tour. The next date is scheduled to be in Bordeaux on 6th of February. We will see if Alizée will be able to catch up Rayane. Either way, this season will be close fight between those two dancers. We, of course, wish the best luck for Alizée & Grégoire and hope to see them to get more wins! After watching the three shows, I have plenty of good memories from Paris. Dozens of photos and videos to share with our faithful fans! Please be sure to follow our Facebook, Twitter and Google+ for the latest photos and videos! The videos will come during next week, I don’t have the possibility to share them right now (other than maybe some small sample). Photos will start coming out when I have time to sort them out and upload! I wish to thank Alizée for the great show and the beautiful moments. Also big thanks to Grégoire who did amazing job as always. Equally big thanks to Gérard who turned out to be amazing person! He was kind enough to spend 10 minutes with us after the show behind Le Zénith, writing dedications, taking photos and joking around! Now it’s time to go enjoy my rest of the vacation here in rainy and chilly Paris… Sun, how I miss you!